spread over an area of 7000 sq. km, at an altitude ranging from 3500 m to 7000 m above sea level. Zanskar definitely is one of the remotest regions in the world to reach and the fact becomes more prominent as it remains virtually inaccessible for 8 months due to bitter cold and heavy snowfall. Zanskar is a semi desert that is surrounded by mountains from all sides and is cut through by Zanskar river which is the reason many people come to Zanskar braving all the adversities. Zanskar River is one of the best places in the world where you can indulge in river rafting. River rafting is not the only adventure sport that you can enroll in here. Trekking and mountaineering also have a great presence here. In fact Zanskar can be completely seen only by trekking through the high rises. It is next to impossible for unprepared tourist to travel inside Zanskar or even reach it during the winters. The summer days though are pleasant, nights turn a bit chilly, so it is advised that you carry woolen clothes with you, no matter which time of the year you are coming to Zanskar. Padum town is 234 km from kargil around 12 hours journey crossing through. Panz:- La pass (4401m). padum is the most popular of Zanskar. Zanskar wih a large concentration of Gompas, is explorerâ€™s most desired destination. Sani Village:- 6 Km west of Padum on the road of kargil.The chief attraction here is the Sani Gompa a castle like monestry exhibits the Kanika stupa which unlike other monasteries of the region is built on level ground.By legand its initial foundation is associated with Kanishka on account of the Kanika Stupa which stands in the background of the walled complex. The main building composes a huge multi-columned central prayer hall housing an array of status of popular Buddhist divinities and Drugpa (old schools) high saints. Sani is also associated with Narapa the famous Indian yogi from Vikramsila, who is said to have sat in meditation for some time under the Kanika Stupa. The site is now occupied by a small roomhousing a veiled bronze figure of the Yogi which is unveiled. Once a year in late july. A 2 day long festivali is held to celebrate this occasion which attended by people from far and wide monks from burden monestry perform masked dances as ritual offering. Rangdum:- Rangdum (3675m) the farthest and the most isolated part of theSuru valley. Rangdum is an elliptical expanded plateau surrounded by colorfull hills on the one side and glacier encrusted rocky mountains on the other. Situated 130Kms south-east of Kargil. It falls midway between Kargil and Padum. The chief attraction of the area is an imposing 18th century Buddhist Monestry with about 40 monks in residence. Perched pictures quely atop a centrally rising hillock which is entrenched around by the bifurcated course of a wild mountain stream. The Rangdum monestry has the aura of an ancient fortification guarding a mystical mountain valley. Zanskar landscape is probably the most unique on entire earth. So, even the attractions in the town are unique from anything you would have seen till now. The main attraction definitely is the river rafting in the Zanskar river. 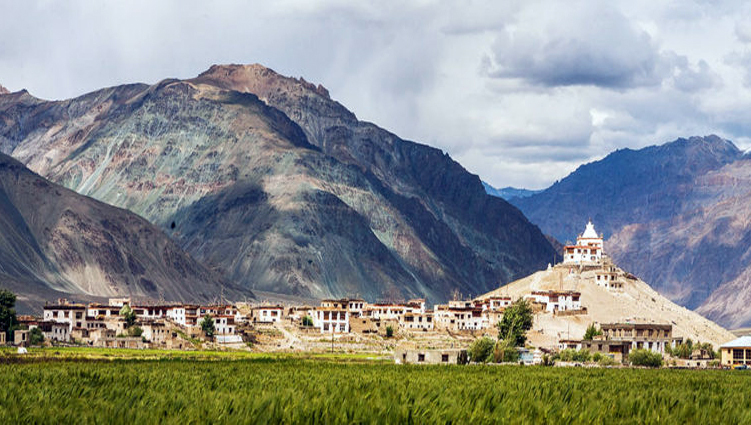 As a matter of fact, every inch of Zanskar is stunning enough, that you just can't afford to miss it. This is the pass that divides Zasnkar valley with the Suru Valley. Situated at an altitude of 4200 m above the Zanskar range, the slopes of the pass are covered with snow in the winter season. In summers, when the snow melts, a large variety of flora and fauna can be seen on the slopes of the pass. The either side of the pass is suited for camping and is often used by travelers and migratory people. Karsha is a large community settled at a distance of 8 km from Padam. The settlement seems to be self-sufficient. It has everything that is required to make it a livable place like market, school, dispensary, and even telegraph and post facilities. You would also like to visit the monastery at Karsha, which highly believed in, by the locales. River rafting probably is the most indulged in activity in Zanskar. The rafting is done in the highly challenging Zanskar River. The rafting experience takes you through one of the most breathtaking gorges of the World. The water in the river is freezing cold and it is advisable that you take this ride only with a wet suit on. This exhilarating adventure through the entire river takes around four days and in between, you will spend the nights in camps set up on the rocky banks itself. Apart from river rafting, trekking also attracts huge number of adventure lovers to these lands. Zanskar has few of the highest mountain passes in the country. The trek routes through them are surely enthralling but trekking here requires ability to take immense physical strain. The most famous trek route is named Chadar Ice Trek. The trek is carried out on the frozen zanskar river during the winter season. You will have to take extra precautions and clothing as you will be literally walking over ice. Other breathtaking treks are Padam to Lamayuru which takes around 12-16 days and Padam to Leh which is 15-17 day long trek. Places to stay are ample in Zanskar. There are numerous tourist complexes apart from budget hotels. You can also opt to stay in your private space by setting up a camp. Monasteries and homes also prove to be a comfortable staying option. Easiest way to come to Zanskar is by road from Kargil. The distance is around 235 km and state transport has its buses running between Zanskar and Leh. You can also hire luxury coaches and taxis from Kargil. Transportation inside the city generally comprise of taxis and jeeps. Most of the locales prefer walking.